The Takman REY (metal film) 1/4 watt resistor is specifically designed for audio featuring very low inductance and microphony. 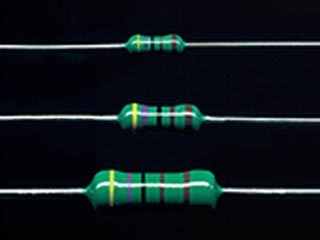 The REY yields a very musical presentation when compared to other metal film resistors. It maintains detail, speed, and air along with a hint of warmth. Our Takman REY is rated at 1% tolerance with a TCR better than 50ppm/deg C (not the cheaper 100ppm found elsewhere). However, it is not uncommon for them to measure within 0.1%. The excellent QC and overall sonic presentation of the Takman REY elevates it to our highest recommendation for a metal film anywhere near this price.